TMC Financing (TMC) provides Small Business Administration (SBA) 504 real estate financing to businesses in California and Nevada. For over ten years, it has been recognized as the number-one SBA 504 lender in northern California. It is also the leading SBA 504 lender in Las Vegas. We re-branded TMC not only once, but twice! The first time they wanted to update their existing look & feel, and the second time when they changed their name from TMC Development to TMC Financing. In addition to logo design and branding, we created business documents for internal use, marketing collateral for all 5 branches, developed email marketing campaigns, seasonal promotions, and annual reports. 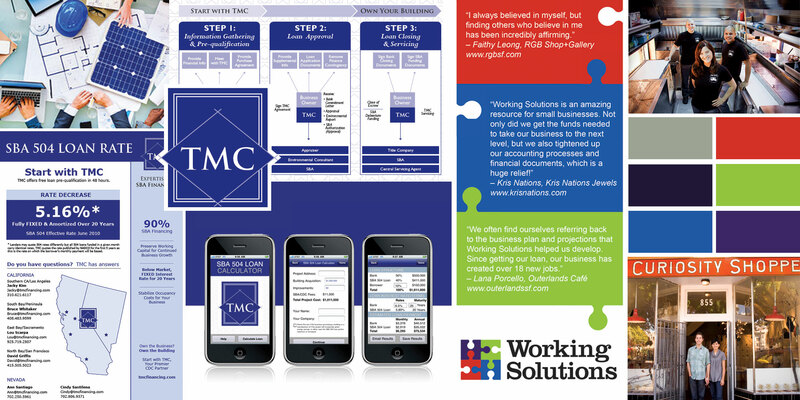 In addition to working with TMC, we also had the pleasure of providing services for TMC’s non-profit, Working Solutions. Working Solutions is a Community Development Financial Institution whose mission is to provide microentrepreneurs with the access to capital and resources they need to start or grow a successful business.